Calf Strains are treated at Solihull Sports Injury Clinic in the West Midlands and are common in athletes who run. Sports such as football, rugby, babminton, basketball, tennis and squash can also throw up their fair share of calf strains. Jumping activities such as dancing or gymnastics can create huge stresses on the calfs and a muscle strain can occur. Often the calf muscle injury is described as a "pulled muscle"or torn calf muscle and the most common location of the strain is found at the musculo-tendinous junction where the calf muscle meets the achilles tendon. This is in a central location half way down the calf. 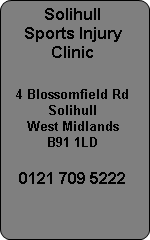 Solihull Sports Injury Clinic provide a variety of treatment for calf strains. The Solihull Sports Physiotherapists and Sports Therapists can provide Sports Therapy, Physiotherapy, Electrotherapy or Sports Massage treatment for the calf muscle injury.